Who do I call in case there is an emergency while I am staying at the property? If there is a medical emergency, please contact 911. Otherwise, if you have a Maintenance emergency or situation, please contact (208) 622-3400 or the Coldwell Banker Distinctive Properties after-hours number at (208) 720-5564. What is the minimum age to reserve a property with Coldwell Banker Distinctive Properties? Where do I check into my Sun Valley Vacation Home at? 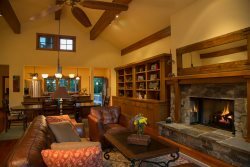 You are given directions to your Sun Valley Vacation Home via email one week prior to your arrival. Your keys and guidelines to the home will be found inside of the home.If you have any concerns or problems, our Coldwell Banker Distinctive Properties. Our office is located at 100 S. Leadville Avenue, Ketchum, ID. We are open 9am-5pm weekdays and are on call on weekends. Are there any hidden or unnecessary charges? What other fees can I expect? No, we clearly list each charge required for each residence when going through the booking process so there are no "hidden" fees after your booking. What things will the Sun Valley Concierge Service help me with? Our Concierge Service staff is available to assist with all aspects of your trip planning. This includes making dinner reservations and recommendations, spa appointments, event planning, and booking guided trips for all of your favorite outdoor activities. Please see our Local Area Guide for more information. There will also be a list of things to do while in Sun Valley and we are happy to assist you with anything you will need during your stay. What is the closest airport to the rental property? NEW! United Airlines with nonstop seasonal flights from Denver (DEN) San Francisco (SFO), and Chicago (ORD). Boise International Airport (BOI) is 150 miles west of Sun Valley a scenic 2.5 hour drive. Many airlines provide daily non-stop flights from several major U.S. cities. Magic Valley Regional Airport (TWF) is located in Twin Falls, 95 miles south of Sun Valley. SkyWest/ Delta Connection provides daily non-stop service to Salt Lake City.